John Oliver may have been an angel to some 9,000 people with outstanding medical debt after Sunday’s episode of “Last Week Tonight,” but an activist group called the Debt Collective says he claimed their idea as his own. “Because ‘LWT’ has previously done a good job of highlighting the outrageousness and injustice of various issues, we were under the impression they were interested in … our ongoing organizing work to challenge these unjust arrangements,” the group said in a statement on Monday. “Instead John Oliver framed the debt buy as his idea: a giveaway to compete with Oprah,” the organization, which acts as a platform for debtors to organize, continued. The episode featured an in-depth segment on debt buying companies, which operate by purchasing outstanding financial liabilities from banks at a fraction of the amount with the intention of collecting it in full. These companies typically do so through aggressive or illegal means, such as harassing debtors and threatening murder if they don’t pay up. Following the segment, Oliver went on to explain how he began his own debt buying company in order to forgive $15 million worth of overdue medical obligations. While Oliver purchased the debt portfolio for just $60,000, the stunt became the largest one-time giveaway in television history, even surpassing Oprah Winfrey‘s infamous $8 million car giveaway. 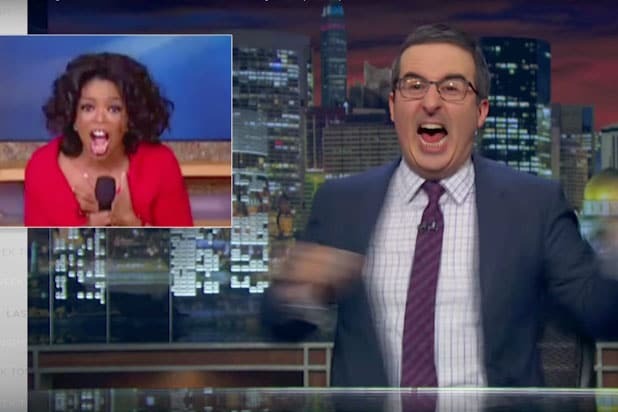 But the Debt Collective claims Oliver and “Last Week Tonight” swiped the idea behind its debt repayment project, The Rolling Jubilee, which purchased debt from banks and essentially abolished it. Though the project, created in 2012, no longer collects donations, it raised $701,317, wiping out $31,982,455.76 worth of debt. The Debt Collective claims “Last Week Tonight” reached out to the organization eight months ago in hopes of recreating its debt repaying project for the show. “We spent hours on the phone and email with them explaining how we did our work and connecting them to other experts and resources,” the organization said. “This line is ironic given that the show has expressly claimed not to be doing journalism,” the Debt Collective statement said. But producers of “Last Week Tonight” told TheWrap that the show did give credit to the organization and reached out to three outside law firms, as well as an array of experts and non-profits specializing in debt forgiveness, including the Rolling Jubilee. “We’re happy to acknowledge the helpful advice Rolling Jubilee provided us — which is why we made a point of giving them on-screen credit, along with our other advisers, at the end of Sunday night’s show — and we’re happy to thank them again now,” the producers said in a statement. However, the Rolling Jubilee — as well as any other debt forgiveness non-profit — was not mentioned in the segment itself. “Whether ‘LWT’ obscured the work of the Rolling Jubilee because it disagrees with our politics or wants to avoid inconvenience of having to acknowledge influence, we are disappointed,” the Debt Collective said.